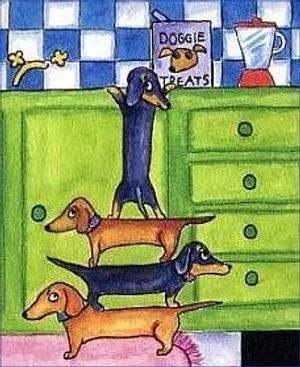 Honeyman's Miniature Dachshunds - 7 Foods NOT For Pets! Growing up in a small farm town had a lot of advantages, not the least of which was a freedom and sense of complete control over one's own contentment and pursuits of happiness. We had a lot of pets. We had cats, dogs, a white rat, turtles, frogs, and anything else we found or that came to us as hungry strays. Back then, we didn't think too much about what our pets ate. We very often gave our pets "people-foods"; scraps from family meals, treats, etc. The local farmers always had a bunch of hungry cats and dogs running around their property, feeding on cows' milk, mice, birds, table scraps, and any other bit of fodder they could find (or that someone nonchalantly and innocently tossed their way). What we did not realize is that we were giving our pets foods which are hazardous for them. For some reason, we believed that if we could eat it so could they. Looking back, that way of thinking, that mentality seems rather ignorant; indeed, even blind to so many things. Funny, though, because we rarely took any of our pets to veterinarians back then either. Hmmmmm...perhaps they (the pets) knew how to heal themselves from all the junk we gave them. Maybe they knew enough natural remedies (i.e., herbs, berries, fruits, weeds, and other 'anti-toxins') to counteract our poisons. There was not a lot of information-sharing back then either. Certainly nowhere near as it is today, and things we learned came much slower then, for sure! I guess life was just a whole lot slower and simpler then. How many adorable pictures have we seen of tiny kittens being fed pure cow's milk, directly from the cow? Now, we are told many cats are lactose intolerant and cannot metabolize the milk properly, so we should not give that to them. Who knew? Avocados contain persin, which is a derivative of fatty acids. Persin is toxic to cats and dogs, as well as other animals, and especially birds. Chocolate is considered to be poisonous to cats and dogs. It contains theobromine, an alkaloid, which can give pets theobromine poisoning, which can lead to death if not treated early. Cows' milk is not considered toxic to cats, but some cats are lactose intolerant, thus milk may give them diarrhea or other digestive symptoms. ASPCA Animal Poison Control Center warns dog owners that products sweetened with Xylitol are harmful to dogs. Xylitol is a naturally occurring sweetener extracted from fibers of fruits and vegetables and is used in a wide variety of desserts, snacks, candies, gums, and the like. Xylitol can cause a rapid and severe blood-sugar drop in dogs, which can lead to seizures, vomiting and weakness. Immediate veterinary attention is required. Grapes and raisins should be avoided as pet snacks, as they have been linked with kidney failure, especially in dogs. Onions contain a substance called N-propyl disulphide, which can destroy red blood cells in cats, causing a type of anemia called Heinz body anemia. Garlic, leeks and chives contain similar substances, although in lesser amounts. Tomatoes and raw potatoes contain the glycoalkaloid Solanine, a poisonous compound which can cause digestive ailments in animals. Did you know that eating certain plants could make your dog sick or worse? plants that can be harmful to your dog. telephone number. Make sure at least one of the contacts has a set of your house keys. emergency, someone will be able to follow the instructions on the sheet to provide necessary care.